One of the things I really liked about the old Modeldecal line from the UK is not only did they provide photos of the planes in question, but also told something about it. WolfPack Decals does this one better and provides extensive background information on each of the subjects on the sheet. When it involves modern jet aircraft, there are also a number of load-out options provided for each set of markings. 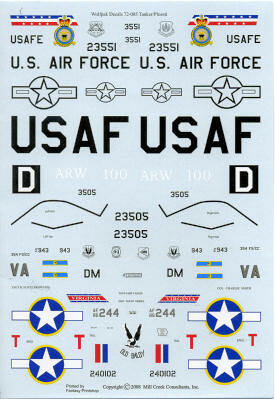 In addition to the historical background and images, WolfPack Decals provides a list of kits that can be used with the sheet. 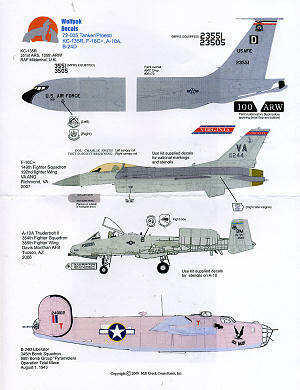 All of this background material helps you to make the most accurate aircraft model around. First up is a KC-135R from the 100 ARW, based at Mildenhall, England. These planes are in overall AMC grey and sport the old WWII unit's tail code on the fin. Two different serial options are provided in case you wish to do the version with the wing tip refueling pods. Next is an F-16C+ from the 149 FS, Virginia ANG. The + indicates upgraded electronics and weapons delivery systems. This plane has the different combination of the 'small mouth' intake and the GE F110 engine. The third option is an A-10A from the 345 FS/355 FW based at Davis-Mothnan in 2006. It is in the current greys scheme. Finally from the 98th BG is the B-24D 'Old Baldy' that took part in the Ploesti raid of August 1943 and was lost on that mission. It is in desert pink with a neutral grey underside. Here I have comments regarding the B-24 insignia provided on the sheet, so please let me provide my reasoning. Two things. One is that the blue surround to the bars is too thin to my eyes. Not sure why it is, but it seems European decal makers have trouble with this. Secondly, the blue surround was not authorized until 14 August 1943 and this aircraft was lost on 1 August 1943. The date for the red surround insignia change memo was 29 June 1943. This stated that the bars would be added and the insignia given a red surround. 'Old Baldy' was lost 32 days after this. I doubt the plane would have had the upgraded insignia considering the time it took to get this information to units in the field, and even if so, it would have a red surround. I would suggest using the older yellow surround insignia on this one unless one has a photo. All the photos I've found of Ploesti mission aircraft show the yellow surround or have it overpainted in blue (which could be an artifact of the film used as often orthographic film shows yellow very dark). I'm more than willing to be shown the error of my ways. For some of the aircraft on the sheet, the insignia and data markings will have to come from the kit decals or another sheet. This sheet is very crisply printed by Fantasy Printshop in the UK and in perfect register. Thanks to WolfPack Decals for the review sample. You can order yours direct via Paypal using sales@millcreekconsultants.com for the reference. Free US shipping, Canada and Mexico add $3 and rest of the world add $4.